A Big Picture Look At “Earth’s Temperature” – "The Pause" Update | Watts Up With That? 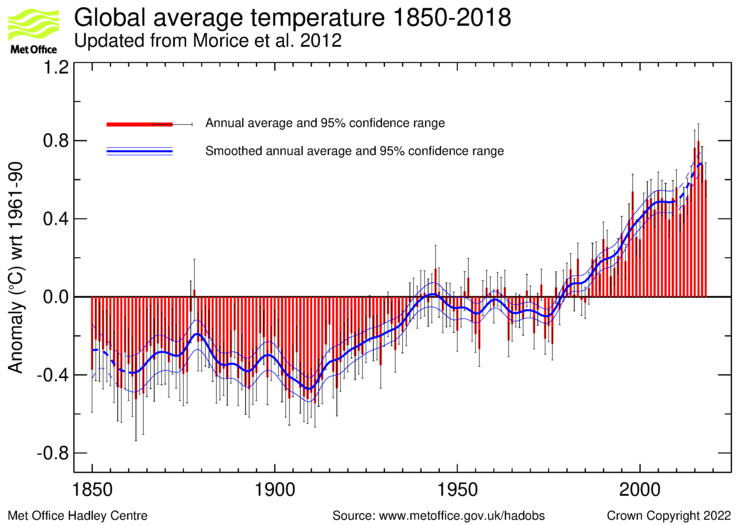 The Pause appears to apparent in Earth’s Land and Surface Temperature record, and if anything the trend appears to be down in the last several years. However, the surface temperature records are burdened with issues of questionable siting, changes in siting, changes in equipment, changes in the number of measurement locations, modeling to fill in gaps in measurement locations, corrections to account for missing, erroneous or biased measurements, and the urban heat island effect. 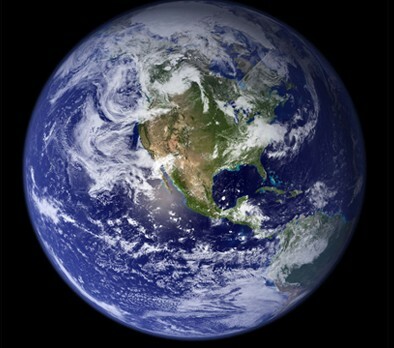 Thus to see the big picture on the temperature “Earth’s Temperature”, it also helps to look up. The March UAH Lower Atmosphere Temperature Anomaly was .18 degrees C above the 30 year average and RSS Global Global Lower Troposphere shows a .130 degrees C increase per decade. looks like it has been in The Pause for its entire record. Middle Tropospheric temperatures appear to show slow warming overlaid with the El Niño/La Niña Southern Oscillation (ENSO) cycle, including several comparatively large El Niño events. Middle Tropospheric temperatures appear to entered The Pause with the large El Niño in 1998.
has been in The Pause since records began in 1987, with a trend of just -.002 K/C per decade. has been decreasing by -.045 K/C per decade, but is currently well above average after a recent spike. have been cooling for more than 3 decades. It seems apparent from the plots above that Global Ocean Heat has increased over the last several decades, and has not paused per se, however the rate of increase seems to have slowed significantly since 2004. The Pause in “Earth’s Temperature” appears in many of Earth’s observational records, with The Pause lasting for at least a decade, and in reasonable portion of the records, it appears to have begun with the strong 1998 El Nino. The questions now are how long will The Pause last and where will “Earth’s Temperature” go from there? Please note that WUWT cannot vouch for the accuracy of the data/graphics within this article, nor influence the format or form of any of the graphics, as they are all linked from third party sources and WUWT is simply an aggregator. You can view each graphic at its source by simply clicking on it. But the PDO is not representative of the sea surface temperature of the North Pacific so it’s a meaningless index for this discussion, especially when we consider that the sea surface temperatures of the North Pacific and the PDO are inversely related. Strange how she only concentrates on the Penninsula and not the main continent. While I don’t have problems with acknowledging that the global warming seems to have taken a pause, I’m still missing sea heat content measurement for 0-2000 m. Selection bias? which puts part of reasoning in that article to a whole new light. If the earth had been cooling, and then temperatures remained flat, the econuts would be shrieking “there, it’s stopped cooling, now it’s going to warrm catastrophically”. But if the earth had been slowly warming, then stopped, they shriek “there, it’ll warm significantly again”. Never do they quietly say “it’s no longer warming, so it could cool, and that, of course, would heve a far more reaching effect on mankind than any warming would”. They never seem to say that, and I wonder why? “And still another study published recently in Geophysical Research Letters suggests that any slowing of surface warming during the past decade may have been associated with a recent accelerated penetration of heat into the deeper oceans. Unless a very hot summer is in store, 2013 is going to be the end of The Pause and the beginning of the Drop. Re Arctic ice extent, yesterday I drove past Dow’s Lake in Ottawa, Canada and noted after the snow of two days ago, it was entirely white – the ice extent still extends down to ~45.4 deg. N lat. You have obviously studied this much more than I, however, having a “broader area of cooler-than-average water off the coast of North America from Alaska (top center) to the equator” that can “remain in the same phase for 20 to 30 years”, seems like it could influence “Earth’s Temperature”. Thus why is the PDO “a meaningless index for this discussion”? Why wonder when it is so obvious? Because CO2 is a greenhouse gas which acts to retain heat in the atmosphere and oceans and it’s levels are increasing in the atmosphere. So why would you back cooling? The biggest factor in a cool PDO is the tendency for La Ninas and COOLER TROPICAL WATERS, which are much greater source for energy to the atmosphere. It is why the southwest Pacific and Indian ocean regions are such crucial “source regions” for global patterns. A drop of 1 degree in tropical water temps energy wise far offsets the rises in cold dry air. It seems to me that this is a big balancing act, inherent to the system which the agenda driven people caught at the right time to try to push the idea of disaster to further their aims, which I believe is a controlled populace. Sorry about the political nature of the last comment , but lets do the math. Seasons, more land north than south., A north pole that is a frozen ocean surrounded by land, a South pole that is a continent surrounded by water. You can go on and on with the reasons that the only constant is change, The idea that you can compare the way we measure things today to estimates even 50 years ago is absurd. In addition its arrogant to think a snapshot of a constantly changing system captures its permanent trend. The very nature of the system is like predicting what a knuckleball is going to do. Lately my writings have been more and more focusing on the absurdity of this whole fight, even though it brings alot of attention to alot of us. But think about it, if the fight ends tomorrow, I have the weather to challenge me every day. But what of people who’s lives are invested in this? What if your whole worth is based on saving the planet ( even if it means shackling mankind) and you have but one issue that everything is based on, rather than the fight every day in front of you with the changing weather? What if your only source of adoration from your students ( or obedience to your decrees) was your stance on this issue? What if your paycheck depended on not being right tomorrow, but by some nebulous forecast for a period years away? Who do you think is going to be the more open minded about this? Thanks for putting this all in one post, this is the argument I have used for years and there really is no valid response from the other side. You could add the lack of more tornadoes and hurricanes, but….good job. Uh Uh the idiots back. Bete du village. Which just go’s to show how far adrift the solar science and climate science boys are at understanding the Sun and it’s interaction with our atmosphere and climate. Bring on that minimum and let’s all learn more. @ The Inquirer. You do know that the sun is about to enter a quiet period quite possibly leading to a minimum. Also the PDo has gone negative and the AMO is about to go negative and the current solar cycle will come down from it’s dismal high in a year or three. co2 is dead, long live the sun. Doesn’t anybody go outside anymore? This year it’s been unseasonably cold – all year (eastern side of the Atlantic). In fact, each of the last 2 years was cool the whole year through – compared to the weather during the first half of the last decade. But this year so far it’s been colder still. Also, I’m in a maritime environment at a latitude with prevailing westerlies. So I assume the cold weather has to do with the winds coming in over cold water. So I assume the oceans have cooled, at least the part that’s nearby. This seems consistent with the unisys pictures I’ve seen. Anyone who calls this a “pause” in the warming (implying that the present climate is the “hottest ever”) is still drinking kool-aid. If you use the down arrow on the prior measurement location data map to go deeper in the ocean you’ll see that coverage gets much worse with depth. The entire AGW theory rests on a brief 20 year period of warming, from about 1978 to 1998. It was cooling before that and flat to slightly cooling after that. I just don’t see how anyone can have high confidence CO2 and temperatures are correlated and causal. Interesting choice of words. From the charts in the post it is obvious that heat is not being retained in the atmosphere. 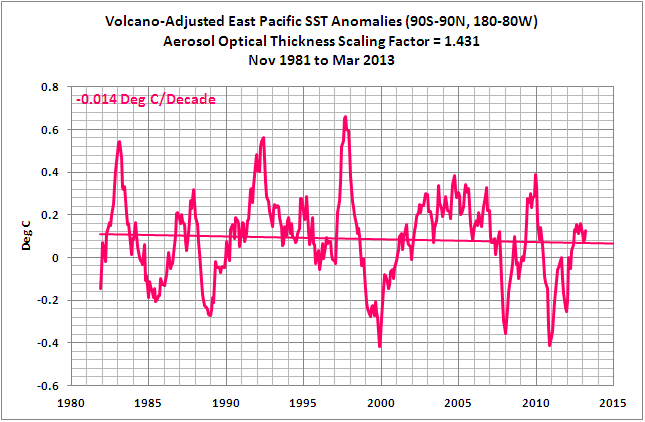 A minor amount of heat is being deposited in the ocean, eyeballing the chart it looks like about 2 x 10^22 GJ per decade. You may be swayed by claims of 3 or 4 times that amount, but please recognize that those claims come from a model that assumes heat is being pumped into the deep ocean, not measurements of that heat or heat transfer. and real-time data on tornadoes and hurricanes can we be found readily there. I’ve been going on about what I call Procedural Certainty vs Representational Certainty. I would be appreciative if others could comment on this idea. For the example of tree-rings, you can see that the two types of Certainty are not similar. The first is valid for the purposes of the study, but only the second is valid for the purposes of understanding how the present relates to the past (and, therefore, for policy matters). Procedural Certainty is what I suggest the IPCC trumpets. The skeptics argue about Representational Certainty. The MSM and public think they are the same thing, and they can be, but most times they are not, and may be quite different. For climate science, to bring one in tune with the other requires correlation studies. For Mann and the others, there are several ways to do this. One would be to take the proxy data (easiest for tree-rings) of the last 150 years from a wide variety of places that have close, decent instrumental temperature records and compare the two. Another would be to take a similar but location-wise different numerical and geographic distribution of instrumental temperature data and process them in the same procedural way as that done for the proxies and compare the results to each other. A third way would be to take the instrumental data and snip it into pieces (“samples”) representing the proportional time-length of individual pieces of the proxies (i.e. 11 for varves, 73 for the allenones of Marcott), leaving the spaces as they develop. This last would be trickier, as to deal with the overlap portions one would have to randomly assign portions of the overlap data to the samples. We hear much of proxy studies but little of proxy-reality correlations. When both Mann and Marcott splice the instrumental period onto their proxies, they present the viewer with a fait accompli inference that the proxy record has a Representational Certainty equal to the instrumental, Procedural Certainty. It does not, which is why we cry foul. As we should. The most egregious examples of the fallacy of the equality of Procedural vs Representational Certainty recently has been the Lewandowsky papers showing skeptics to be flat-Earth conspiracists, but the greatest of them was the paper that said 97% of scientists support CAGW and the IPCC narrative. Procedurally both these claims are correct, in that what they did produced those results, but Representationally neither is correct. A paper or two showing the difference in theory and practice would go a long way to showing on what foundations of sand the edifice of Anthropogenic Global Warming has been built. I measured the rainfall today at my house for 5 minutes. The trend was alarming! If this continues a global flood will be imminent! That’s what all the alarm amounts to. Measuring temperatures in different places over a VERY short timespan and becoming alarmed at the results. Chicken Little’s got nothing on this. I think the prudent course of action at present would be to admit that our understanding of Earth’s climate system is rudimentary at best, our historical instrument record is laughably brief and our current predictive capacity as it pertains to the trajectory and likely future state of “Earth’s Temperature” is essentially nil. As such, our best course of action is to conduct more research and prepare to adapt to Earth’s climate regardless of how it changes. What do you think? The newest version, in addition to having data through early 2013 instead of just 2011, also seems to have some additional adjustments to the pre-2011 data. Not sure just what the justification is for those adjustments. thus I am quite aware that the present climate is not the “hottest ever”. “The Pause” is simply a helpful meme to help our Warmist friends migrate away from the now untenable “Rapid Warming” meme. HadCRUT4 includes 2012 and shows a near 0.05°C cooling from 2003 to 2012. Anyone up for a betting pool based on Russian climatologists’ prognoses that beginning 2014 a 70-year “dead sun” Grand Solar Minimum will gather force, likely reaching the epic proportions of 1645 – 1715, when wolves froze to death in Rhineland forests and Louis XIV’s goblet frosted over at banquets in Versailles? 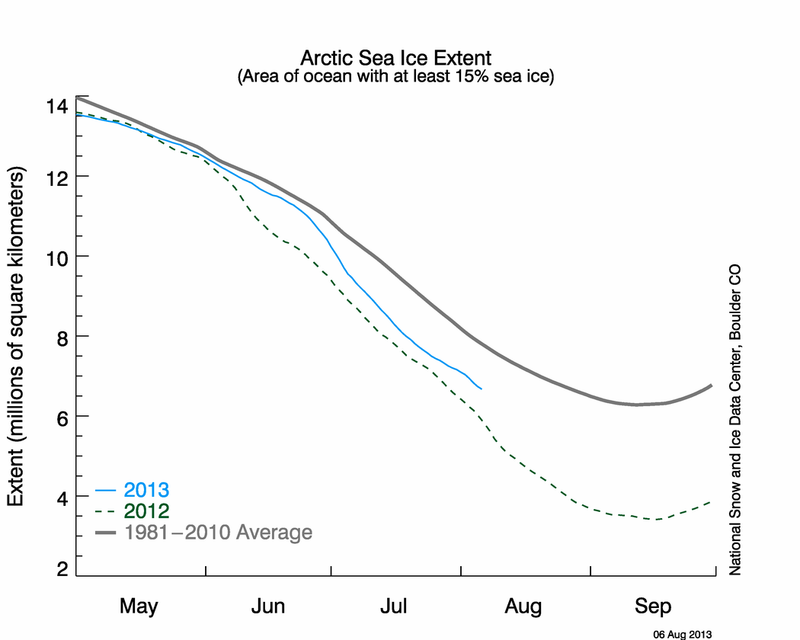 If ice-breakup in Alaska excites the gambling confraternity, why not far more significant cooling just a year from now? This is a beginning but it is way weak. Ground proxy studies in actual empirical research. Let me give you the flavor of this. Near each tree that you select as a tree ring proxy, select a few more. Use one of the additional as the null case. On the others, experiment. Add water to one. Fertilize another. Whatever is needed in that environment to determine what factors influence growth of trees. Carry on the experiment for decades, centuries if necessary. No climate scientist who uses proxies has ever performed experiments. All of them presume that tree rings are God’s chosen thermometers. None will discuss the matter. Yet they call themselves scientists. Very enjoyable read about important information. The part about surface and ocean temperatures is more enjoyable, maybe because of your commentary. Emphasize the exceptional nature of satellite measurements of temperature. Use Mr. Tisdale’s work whenever possible. The PDO is an index that’s statistically created from the sea surface temperature anomalies of the North Pacific North of 20N. 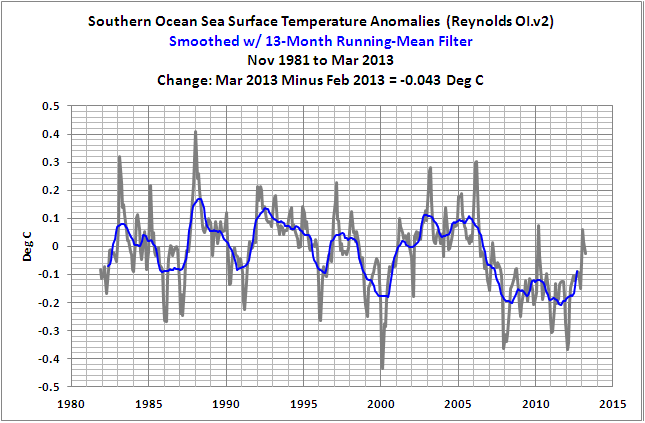 But it does not represent the sea surface temperature anomalies there. I believe, other than the Apparent Atmospheric Transmission of Solar Radiation, all of your other data represented temperature anomalies—except for the PDO index. …the PDO data is derived from the sea surface temperatures north of 20N–about Hawaii, not the entire Pacific—where ENSO is dominant. Honolulu is at 21N. Looking at the map, one of the indicators of the cool PDO is the cool sea surface temperature anomalies of the eastern North Pacific, north of 20N, along the west coast of North America. But notice the area east of Japan. It’s called the Kuroshio-Oyashio Extension or KOE. The variations in the sea surface temperature of the KOE typically oppose those along the west coast of North America, especially when the PDO is at extreme high or low values. The sea surface temperature anomalies in the KOE are dominant in the area of the North Pacific north of 20N, not the eastern portion along the west coast of North America. Therefore, the sea surface temperature anomalies of the North Pacific, north of 20N, are generally inversely related to the PDO index. 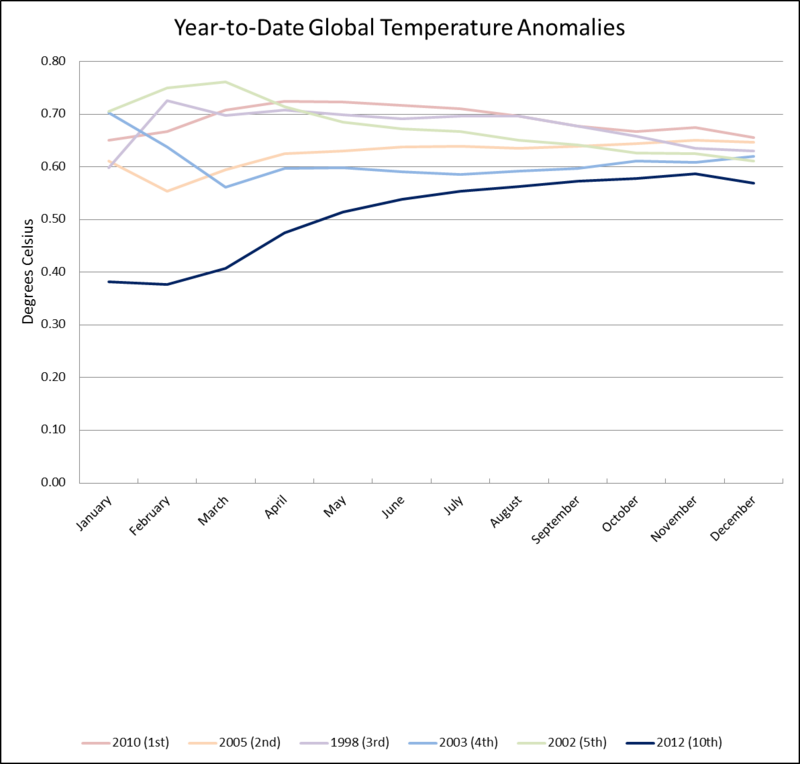 In no way does it look like the PDO index data. Looking at the graph I provided, the actual sea surface temperature anomalies for that region have cooled since 2005, but, at best, based on the smoothed data, they’ve only cooled back to the levels they were at in 1995—not “since Earth’s last cooling period”. justthefactswuwt, PS: Thanks for adding my graphs to your post. For the casual reader, give a practical interpretation of the scale. 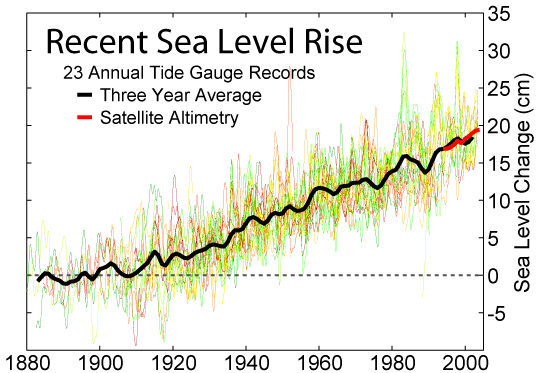 Oceans rising 1.19 millimeters per year will rise 11.9 mm per decade, 119 mm per century, and 1.19 meter per millenium. It’s not a ‘pause’ until the warminng resumes. The PDO index is a number with + and – values but those “signs” do not mean warm and cool. It is unfortunate the technique used to derive the index gives the + & – signs as part of the output. In hindsight the creators ought to have used something such as the Eagle pattern and the Salmon pattern. Then folks could say the PDO was big Eagle pattern or little Eagle pattern, or strong Salmon and weak Salmon. Viewed in the manner shown, the shape is one thing; we can call that the “minus” pattern. Think of looking on it from the end, then it would look round or like a circle; call that the “plus” pattern. Which is cool and which is warm? Just The Facts: Nice post, but you’ve got the RSS Northern Hemisphere Temperature graphs and NOAA Ocean Heat Content graphs muddled up…they need to be swapped over in location within the post. Let’s check it: The mass of the amosphere is 5.148×10^21g, the weighted average (by air density) temperature of the lower 99% of the atmosphere mass (~33 kilometers) is 252.5°K, the average surface air temperature is 288.15°K, the ocean area is 361132000 km2, the average surface seawater density is 1,027 g/cm3, the mean surface seawater temperature is ~290.15°K, the heat capacity of the air is ~1.02 J.g-1.K-1, the heat capacity of the water is ~4.2 J.g-1.K-1. Therefore so simplified the relative heat capacity equivalent to the whole atmosphere comes to me out being as the upper ~3.1 meters of the ocean which very well agrees with the Australian MetOffice number. How it comes that while there’s the downward trend in the Sea Surface Temperature since the peak of the solar cycle 23 (http://www.woodfortrees.org/plot/hadsst2gl/from:2000.25/to:2013/plot/hadsst2gl/from:2000.25/to:2013/trend/plot/hadcrut4gl/from:2000.25/to:2013/plot/hadcrut4gl/from:2000.25/to:2013/trend) there’s still an upward trend in the Ocean Heat Content (http://www.nodc.noaa.gov/OC5/3M_HEAT_CONTENT//heat_content55-07.png). Where all the heat to the sea comes from? One could say it is because there’s still like 0.031°C/decade upward trend of the average surface air temperature (the violet line) for the same period. The problem is that the average air temperature is ~3°K lower then the average sea surface temperature, so it would defy 2nd thermodynamic law if one claims that the air heats the water in the ocean. This looks to me something doesn’t ad up. Anybody? Great information – when will the warmist admit failure to launch? @ The Inquirer. The Inquirer seems to have stopped inquiring. If CO2 retains heat in the atmosphere and CO2 is increasing in amount, why is the atmosphere not heating up anymore, for 15 years it has failed to heat? The sun is in a quiet period, possibly leading to a solar minimum. PDO is negative, AMO is soon negative and the Northern Hemisphere and Antarctica are experiencing nasty cold periods. It is time for more inquring. 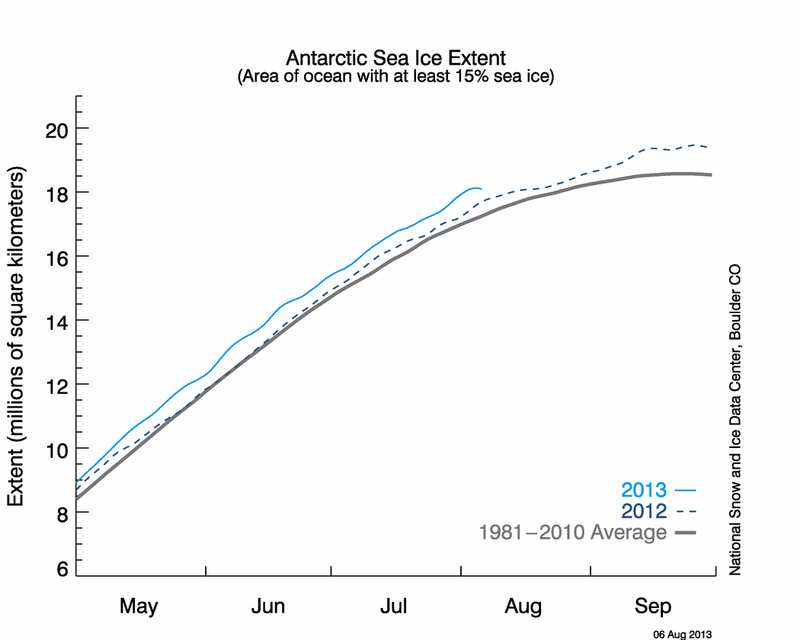 SH sea ice extent is trending well above last year’s record levels. SH sea ice is the climate metric that is least affected by local to regional scale anthropogenic effects, and is therefore the best measure of what is happening to the Earth’s climate, when all the other factors, aerosols, etc. are removed. And it clearly says the climate is cooling. I am not lost for I stand among giants who tell me what they see. What about considering displacement? With underwater volcanic ejections and land erosion contributing to sea level rise. While subsidence contributes to level falls. I imagine that displacement is a difficult parameter to take into account, but I suspect a significant influence on sea levels. If the large eruptions quoted can have such effects could numerous smaller ( and concentrated in Russia and Indonesia, as well as the western region of the ‘ring of fire’ ) also have an effect on climate; especially for the Pacific Ocean. Does an increase in volcanic activity and earthquakes ‘heat’ the oceans? 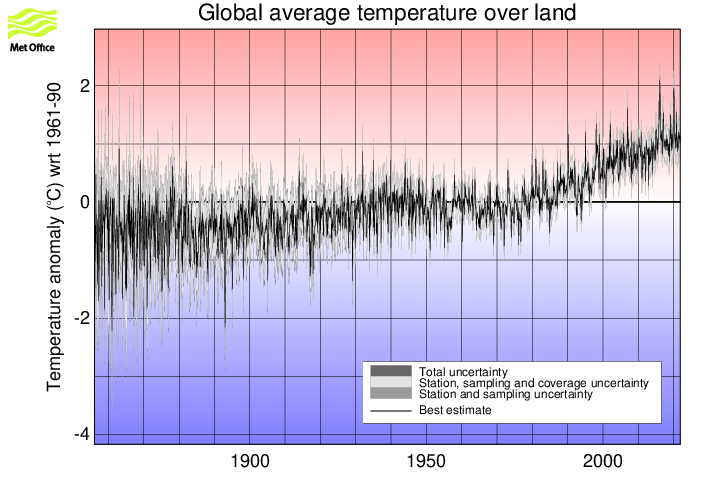 I realize that the general public can not be expected to fully comprehend the detail science aspects of global temperature trends, but this post is a very telling presentation and represents the type of information that supports the ‘skeptics’ beliefs and arguments. It seriously challenges the “science” upon which the agenda driven climate scientists base their beliefs and arguments. One needs to be sure that what they believe in is likely to correct. Especially as they are risking their own future well-being by following the carbon control trail. To believe in saving the planet is absolutely correct but to be misled by the ;climate change’ propaganda is unfortunate indeed. you’ve got the RSS Northern Hemisphere Temperature graphs and NOAA Ocean Heat Content graphs muddled up…they need to be swapped over in location within the post. I am not sure what you mean, can you please provide additional details and links to the graphs that you think should be swapped? Uni. East Anglia CRU is NOT Met.Office. Hadley these are two different organisations. It would be good to correct those slip-ups. Very good overview article though. Quotes from Ellen Thomson’s work particularly interesting. I have a few ideas about what stratosphere tells us but don’t have time to comment right now. Diagram showing area weighted Arctic (70-90oN) monthly surface air temperature anomalies (HadCRUT4) since January 1920. You do a series of calculations and nicely confirm that the atmosphere has the same thermal capacity as the top 3.2m of ocean. Nice one. That’s a useful parameter. Why “conjecture”? This quite likely can be true, we just don’t know how long the lag is – the 99 years would be most probably quite variable because interacting with other independent variables – e.g. solar activity given the different rates of the insolation changes in different times (for example now we experience the fastest decline of the solar activity since the fall into the Maunder minimum – the SIDC-SSN descended from 80.9 average SSN in the Hale cycle SC 21-22 to 34.4 average SSN of the current SC24 and the average will be even lower at the end of the SC24 – this translates into 0.7-1W/m2 decline of the average TSI per solar cycle). I think that only place, where the warmer water on the ocean surface can significantly go deep (not just conduct heat deep – the liquid water doesn’t have too big thermal conductivity – just 0.58 W/(m·K) anyway) is in the polar regions – where the temperature of the water gets under the critical point of the water dilatometric anomaly – i.e. where the water is colder than ~4°C, there the warmer water sinks because it has higher density than the colder water. Otherwise it very much stays on the top having lower density and the temperature profile is the standard themocline. That’s maybe why the warming of the ocean would take quite a time and the thermohaline currents will take chief part in this. Also it is in the polar regions where the water gets in the contact with the ice and the latent heat starts to play its role. The warmer water in the currents melts more ice, which in turn cools the water with some lag. So the episode of a higher insolation can have with some lag an effect on the polar melting. My guess is that this lag is one to two solar cycles, due to 1. partial cancelling effect during one solar cycle – the insolation first rises into the peak of the cycle, and then again descends from the peak to the minimum partially cancelling the effect of the rise and 2. another limiting factor is the speed of the thermohaline currents which transport the warmer water to the places where it can sink deep. My calculation was quite simplified – it used the standard atmospheric model and quite rounded numbers, that’s maybe why it doesn’t fit the Australian MetOffice estimate closer. One problem I see with the calculation are the polar regions where the water temperature is under the ~4°C. There’s a different thermocline than in the rest of the ocean and much deeper mixing. But because the heat content is there much lower than at the lower latitudes I ommited it. It’s not a ‘pause’ until the warming resumes. Thank you! For the time being it’s … what … a levelling? “Just the facts”! That 3 plus meters of the ocean can get very much warmer or only a bit warmer. Why? It depends on how much short wave IR, which can zoom through things like CO2 molecules in the air, gets to the ocean. It’s like Superman’s xray vision. His xray’s can’t penetrate lead, shortwave IR is reflected away by clouds. The Earth’s own parameters are very powerful modulators of our Solar’s main component, SWIR. The oceans’ 3 meters of heat vs that of the air is not an actual measurement in situ. It is a general calculation between the two types of “stuff” and that “stuff’s” ability to absorb SWIR. In situ, you may find that at any given moment, the oceans’ 3 meters at the top is holding a LOT more heat than the atmosphere is. And to be clear, the premiss of AGW, is that the atmosphere is perpetually aborbing and re-radiating LWIR from the surface (a proposed combination of CO2 re-radiating LWIR coming from the surface, and water evaporation from an overcooked surfaced which re-radiates more LWIR), thus warming the oceans, which then warms us. In a sentence, the air must be capable of holding more LWIR than the skin of the ocean AND in order for that heat to stay and build in the oceans, it must heat the ocean temperature BELOW that skin. This is not an in-the-future model. The premiss of AGW is that these conditions are happening right now. Alas, the travesty is that this cannot be demonstrated by in situ measurements. Therefor the heat that is supposed to have been transferred into the oceans from the air must have been suddenly transported (Beam me “down” Scotty) very quickly and directly into deep regions of the oceans we cannot measure adequately with current devices. Theory plus magic. Want a spoonful? Correction: It is a general calculation between the two types of “stuff” and that “stuff’s” ability to -hold onto heat generated by whatever generates that heat-. Dang. I really mangled the part about heat versus LWIR. At the common level we use these two terms interchangeably and they are not the same thing. “Its” is the possessive for “it”, as in “its characteristics”. Exactly. The currently available evidence supports both of those scenarios. One would only choose “Pause” if he is stumping for the “global warming” meme – and willing to ignore the incompatibility of a “Pause” with the “global warming” model predictions. I still think it is funny we are measuring global warming or cooling in hundredths of a degree. Your charts for the most part with the exception of one or two have no more than a degree above or below the mean line. Are we so sure of our accuracy? Really, is one degree hotter or colder a tragedy? We experience a greater temp change between any given summer and winter.. if one degree were such a tragedy…. we’d all already be dead. their Temperature Troposphere / Stratosphere (TTS) measurement. Or maybe not. Let’s say you are running around a field and after a while you tire and pause to catch your breath. What about the word pause connotes that when you continue running, it will be in the same direction you where running in before? The Pause, is just a helpful way for those who believed the “Rapid Global Warming” meme to come to understand that it isn’t occurring at present. And “The Plateau” just doesn’t have the same ring to it. Yes, that would be scary, but let’s see how the data unfolds. If the data does start to point to an extended decrease in temperatures, then maybe we will write about “The Turn” and “The Decline”. I would say “over the hill”. Yes, you’ve clearly figured me out, just a closet Warmist stumping for the “global warming” meme. Or maybe not. Let’s say you are running around a field and after a while you tire and pause to catch your breath. What about the word pause connotes that when you continue running, it will be in the same direction you where running in before? You weren’t talking about running. You were talking about warming. Drawing an analogy between the two as you have is not valid. Running does not have a necessary direction for its vector. Warming does. 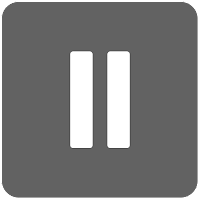 When you reference a “pause”, you aren’t talking about a pause in temperature. That would be nonsensicle, as would be saying that “the warming has resumed, in another direction”. You are talking about a pause in warming. In the same way that talking about a pause in running implies that the running will resume, discussing a pause in warming implies that the warming will resume. The Pause, is just a helpful way for those who believed the “Rapid Global Warming” meme to come to understand that it isn’t occurring at present. But it does so in a manner that assumes the meme. Pernicious little meme, hanging on so tightly that JTF’s Razor doesn’t excise it. And “The Plateau” just doesn’t have the same ring to it. Interesting, perhaps for your next article you could add in a section on the period of decline to present in each of the data sets? Wow. So clearly presented and quite compelling: nice work. Thanks. Then I would tweak the introduction to answer the question. You may want the graphic below as the attention grabber. Head of the Russian/Ukrainian Joint Project Astrometria…..” (talking about the coming cooling). My bets are on Habibullo! 🙂 No worries about unknown infections, the selection of “The Pause” was by my own volition and with a well thought out intent. While, as a skeptic, you may perceive it as Warmist vocabulary, for a believer in the rapid Catastrophic Anthropogenic Global Warming, it offers a healthy gut check, hopefully on the path to a more informed viewpoint. Funny on the frozen front, but our goal here is to open minds, thus we need to use a vocabulary that speaks to, and resonates with, a broad audience. It is easy for a believer to dismiss “The Freeze”, but “The Pause” is much more likely to stick. Definitely seems like a worthwhile article. Do you have the exact period of decline in each data set, similar to the excerpt from your last article that I used in the intro to this one? Do you have the exact period of decline in each data set, similar to the excerpt from your last article that I used in the intro to this one? However the slope for these 16 years and 4 months is -2.3524e-05 per year. So when I say “flat”, it is actually negative, but so small that you cannot even see it most of the time. Furthermore, every month that is less than 16 years and 4 months makes the negative slope larger until we get to 15 years and 4 months where the slope is -0.00459907 per year and is very clearly visible in the URL above. By trial and error, I found that the slope from 1997.25 is -0.00198635 per year. So to give a better answer to your question, your question needs to be more meaningful. For example, do you perhaps want the maximum time above 6? years where the slope is at least -0.002? for example? One of the key causes for the “pause” may be the saturation, or at least the trend to saturation, of urbanization worldwide, which diminishes the rise in surface temperature readings. Meanwhile, temperatures have continued to increase. Any reason for missing the summer Northern Hemisphere snow cover from the analysis? Which one of those lines is longest and which two lines are closest together? For example, do you perhaps want the maximum time above 6? years where the slope is at least -0.002? for example? Can we do the period of decline that is statistically significant to two sigmas? Answer: i) green, last ten years. The implication of your questions is that although no-one claims that the first two declines shown on the above graph (ie from 1980 to 1987.5 and from 1990 to 1997) signified a real pause in global warming, the present decline (last ten years) does so. The period during which those first two declines occurred is universally recognised as a period of global warming. Indeed, Clay Marley, April 14, 2013 at 12:02 pm, emphasised that point earlier, referring to, “a brief 20 year period of warming, from about 1978 to 1998”. The present decline is just a few years longer than those previous declines, (though none of the decline trends shown are statistically significant). Do you regard the present decline as signifying a pause in global warming when previous declines manifestly did not? If ‘yes’, what is your justification for so doing? If ‘no’, what are you on about? Outstanding article JTF. Thanks. It’s a great compilation. Pause, hiatus, peak, rest, the semantics are irrelevant. The fact the IPCC acknowledges this “plateauX” is relevant and important. One wise commenter’s adage ” The truth is the daughter of time” , sums it well. We’ll see in time what the correct verb is. I personally am ecstatic over the fact that we all aren’t doomed. Why is good news rejected readily while bad news sticks and sinks in? “Verb” should be “verbage”. oops. Anthony: OK, I get your point although I did not know that. But the point is the same, wasn’t it? The short timescale really moots the discussion? I mean isn’t the high variability in climate data explained by ‘weather’? And that’s why we use longer timescales? i admit I’m confused over this very long post because it is only talking about a short period of time and I don’t see how the decade and a half data is useful? In the end, the conclusions are that, yes, there’s a pause, and it’s clear in many different data sets and in the same (short) time period. But so what? I recall seeing someplace a graph with a longer timescale showing similar episodic ‘pauses’ that were nonetheless buried in an overall and significant upward trend. That’s all. Yeah, Hansen was forewarning Congress about impending warming (predicated on established physical processes), there would’ve been no point in him doing that after the fact. No, we are not even close. When you have short times, the error bars are huge. And when the times are long, we just have not had that much cooling. The closest seems to be RSS from December 1997 and even that is -0.044 ±0.241 °C/decade (2σ). Hadcrut3 from that point is -0.010 ±0.146 °C/decade (2σ). However even if we cannot show this to any significance, the diagrams I showed before clearly show the sine wave part and that we are on the way down. According to NOAA, 15 years of no change is significant in terms of how trustworthy their models are. “MORANO: Sure. 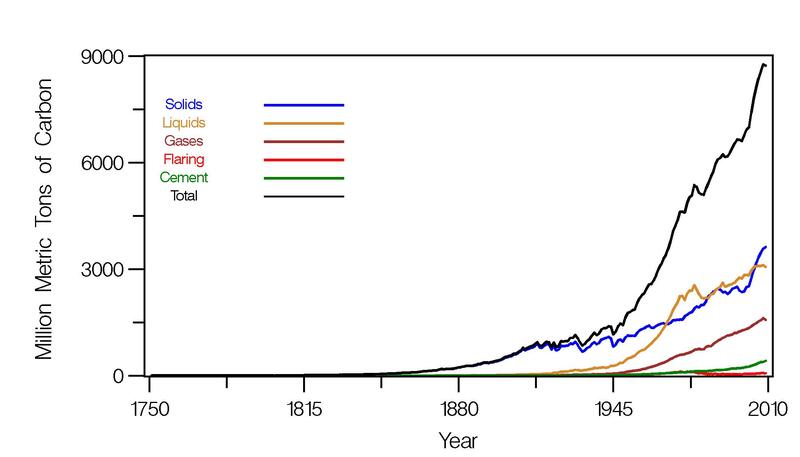 Carbon dioxide is rising. What’s your point? That makes it all the more puzzling why temperatures have not risen in 16 years or more on three data sets. The period during which those first two declines occurred is universally recognised as a period of global warming. Indeed, Clay Marley, April 14, 2013 at 12:02 pm, emphasised that point earlier, referring to, “a brief 20 year period of warming, from about 1978 to 1998″. No, I regard the present 10 year decline in temperatures as interesting and worthy of more research and careful monitoring. I find the 12 – 16 year period of flat temperatures as evidence of The Pause in temperatures, which runs counter to the Catastrophic Anthropogenic Global Warming narrative. Understood, but I think we want to be really careful with how talk about decline, as we have limited confidence in it and don’t want to do exactly what the Warmists have done, i.e. ignore the uncertainty in the rush to prove a point. I like your positioning of Pause versus Peak, as it raises the subject without getting too far into length or significance of the decline. If someone can offer a reputable source for Summer Northern Hemisphere Snow Cover I’ll review it for inclusion. The trend since 2005 is slightly negative, the trend since 2006 is slightly positive, hence The Pause in Global Sea Ice Area has lasted for between 6 to 7 years. Certainly not as long as The Pause in temperatures that Tamino so judiciously avoids, but a Pause nonetheless. tamina has such a small following that his blog amounts to a thinly-populated echo chamber. He actually appears to believe that global warming is rising fast, and that the 2000s were the warmest decade, and that the rise in CO2 is the primary cause of global warming. None of those assumptions are supported by verifiable scientific evidence or observations. CO2 continues its steady rise, with no commensurate global warming as was universally predicted by Hansen, Trenberth, the IPCC, and many others. In any other field of science, the fact that CO2 does not cause the predicted global warming would blow the CO2=AGW conjecture out of the water; grant funding would dry up, and honest scientists would be discussing why their CO2 conjecture was so very wrong. But not in climate ‘science’, which is not science at all, but politics. Thus, tamina is playing politics, overlaid by a thin veneer of pseudo-‘science’. Unfortunately for him, the real world is busy falsifying his beliefs. And now the general public is beginning to wonder why the “carbon” scare is still being promoted. The answer, of course, is money, and lots of it. And the Sequester appears to have left that funding source unscathed.